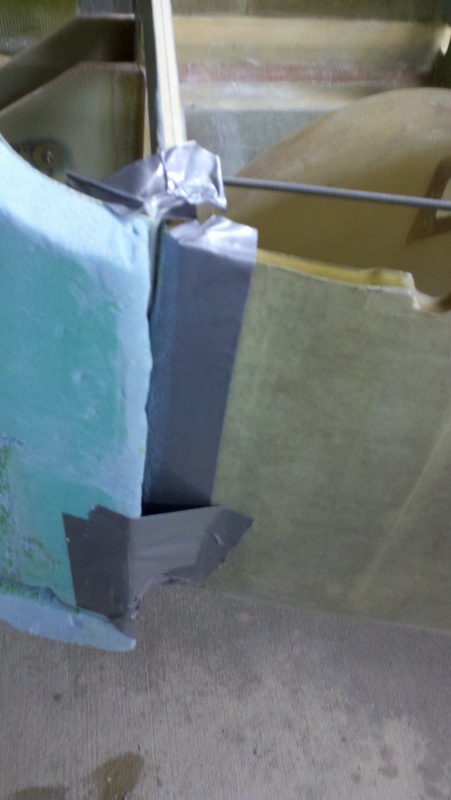 I used duct tape to dam up the sides where I cut through to reposition. Mixed up pour foam and added in the void. I opted to do this instead of micro and foam scraps since it will be much easier to contour later if I don’t have micro to sand through. After the foam dried, I sanded down and reapplied 2 layers of BID on the seams, and then 3 layers BID buildup over the lift tabs. Finished up with peel ply. Removed peel ply on the NG30’s, and reassembled the nose gear. 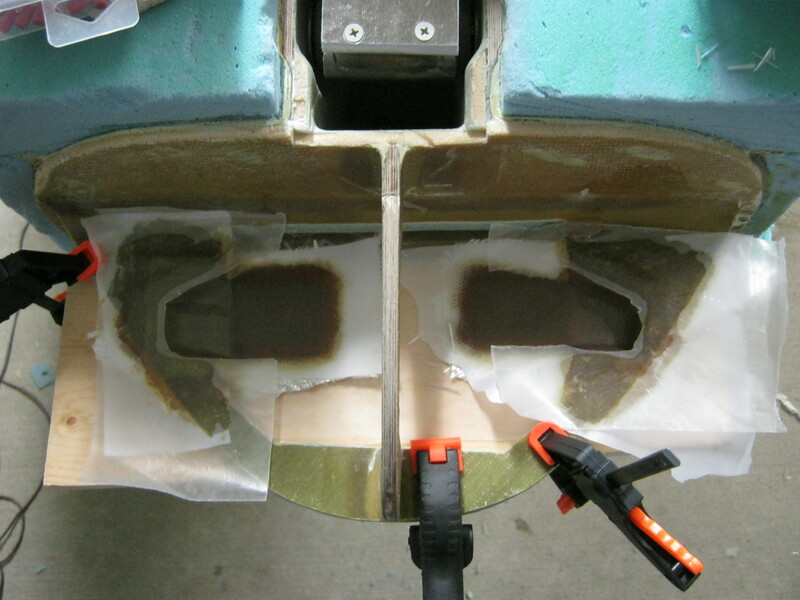 Trimmed and dressed the fiberglass from the night before, and reinstalled the canard to check measurements. Still look good! 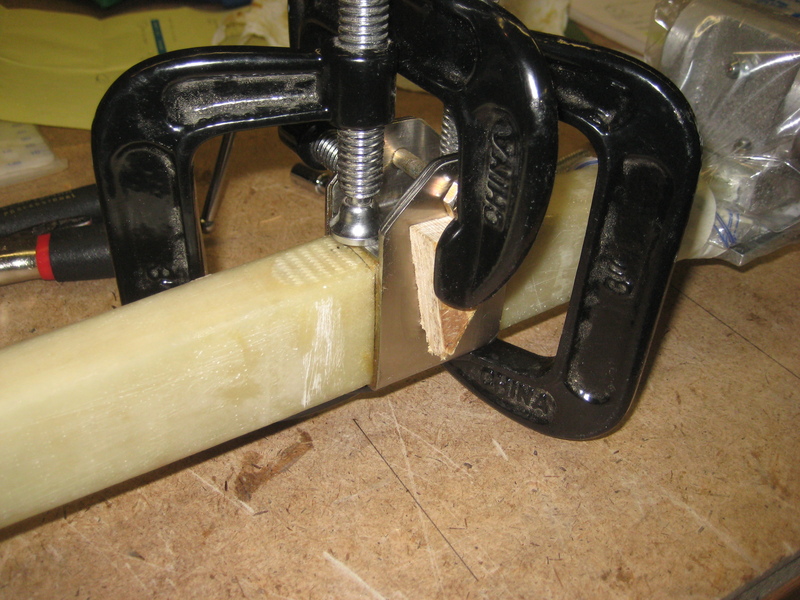 Cut out the 2″ urethane foam for the top of the nose and sanded to the proper dimensions. Decided to start over, as I sanded way too much off on one side of the top. Oops. After getting it just right, I glued it on temporarily with dabs of 5 min epoxy and turned the fuselage upside down for the next step. Apparently I didn’t use enough dabs of epoxy, as the top fell off over night. Since the fuselage is upside down, I was still able to glass the foam edges of the nose wheel opening. 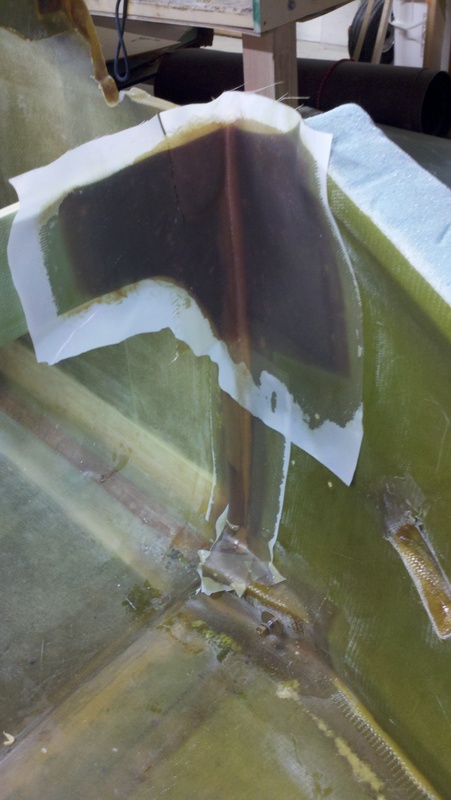 After Kim woke up, we flipped the fuselage back over and doubled up on the dabs of epoxy this time and turned back over. Added a few nails this time until I’m ready to carve. I also was able to find some Blazer driving lights (RE774C) that will work, so I snatched them up. After doing some shopping at the hardware store, I found some nuts and bolts to mo0unt the lights. Mounted them for a test fit and verified clearance in the nose cone. Turned the lights on while holding the nose cone in place temporarily. Marked the pattern on the nose cone. Marked the center marks on the nose cone. Did this by first finding the center of the nose cone. Then taped a piece of string around the circumference, folded in half and marked the string, then folded again and marked the 1/4 points. Then put the string back on the nose cone and transferred the marks onto the nose cone, which gave me center marks top and bottom, as well as center marks left and right. Then I was able to come up with a lens pattern for the headlights. 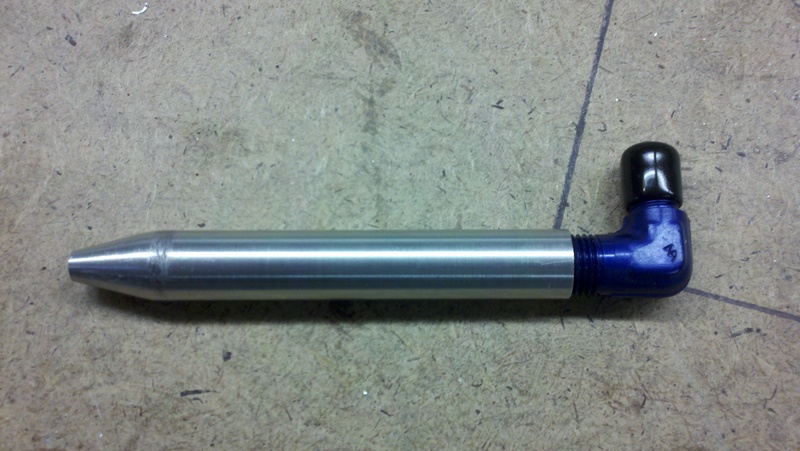 Cut off the end of the pitot tube, and drilled out the end to 7/16″ bit, and tapped using 1/4″ NPT. I was concerned about bolting the lights too tight and c rushing the foam, so I decided to remove the foam and fiberglass on the bottom of NG31 where the lights attach, and replace with 6 BID for reinforcement. Trimmed the layup and tested lights for fit again. 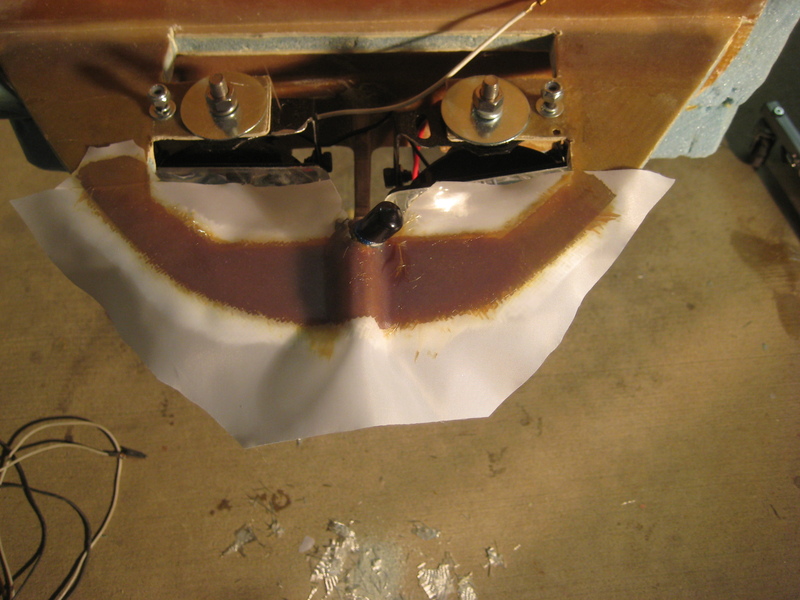 The outside flange was catching the fiberglass curve, but was able to bend for clearance. Found a piece of 3/4″ conduit from a coworker to fit the pitot tube into for the removable pitot. Didn’t fit, so I used a 5/8″ drill bit to bore out the hole. Then I cut the rest pretty much as shown on Wayne Hicks’ site. In my attempt to drill out the pitot tube perfectly center for tapping new threads, I found that I still got off enough to cause problems. 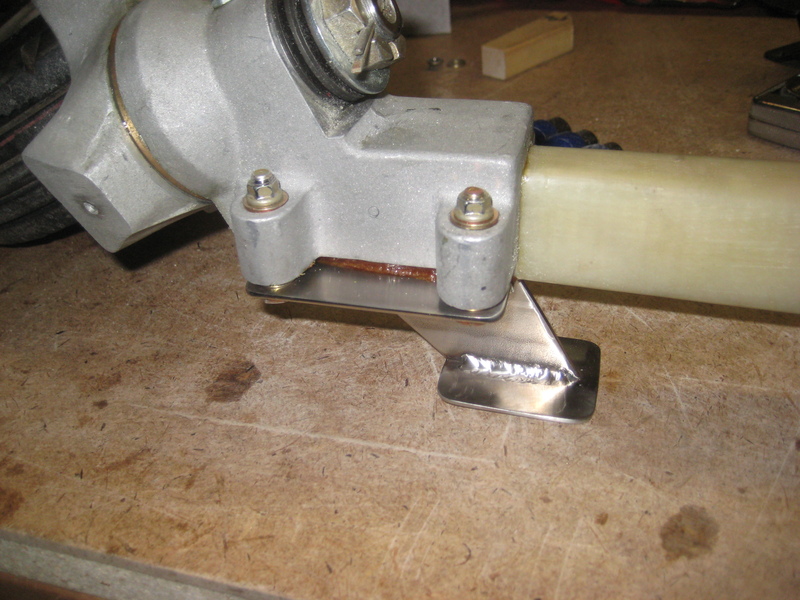 The pitot tube would bind when screwing onto the fitting, unless the fitting was allowed to move around to compensate. Since the fitting will be floxed in, that won’t work after cure. I shortened the conduit to the correct length and was able to grind down part of the pitot tube where the wall thickness seemed a little thicker than the rest. Hopefully that will allow the pitot tube to be removed after the flox dries. 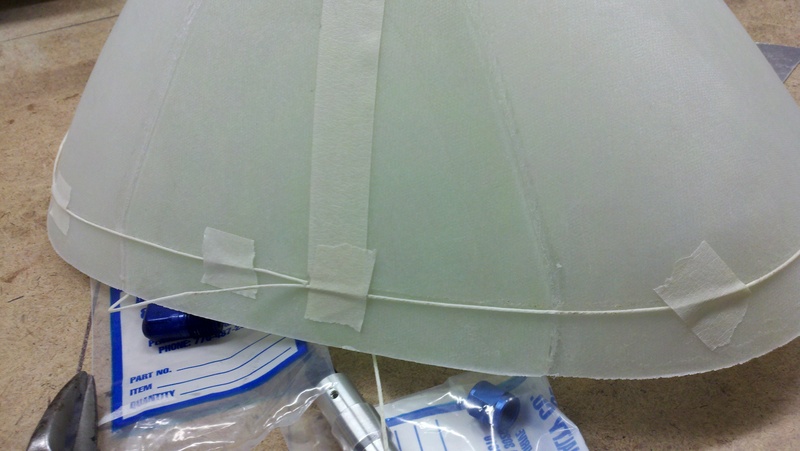 Added some petroleum jelly to the threads of the fitting and floxed into place. Did some additional filing on the pitot tube thread end to help it screw in and out of the end. 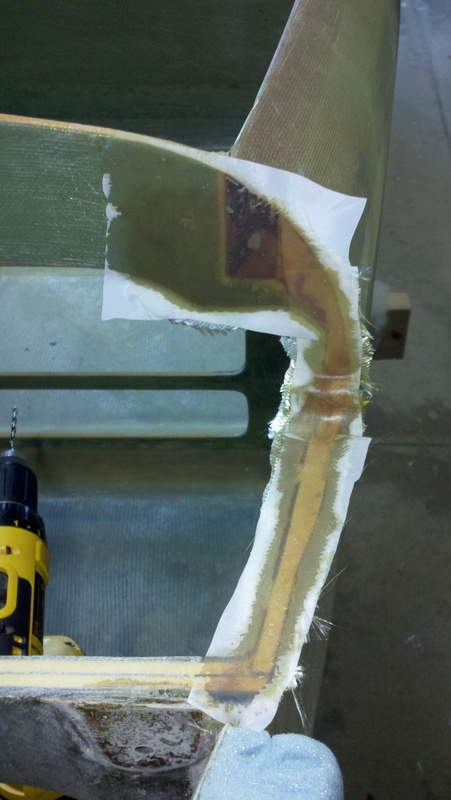 Sanded out a foam contour to match the pitot tube in NG31. Floxed the sleeve in place and covered with 5 plies of BID and peel plied. Ran tubing for the pitot tube to the instrument panel and flared the end to connect to the fitting at the pitot tube. Removed NG3 and NG4 from the nose strut in preparation for the new NG3 and NG4 from the nose strut in preparation for the new NG3A and NG4A coming with the electric nose lift. Also sanded down F0 some to fit the nose cone. Removed Ng2 foot from the MKNG15 wheel assembly. Checked fit for NG3A and NG4A after removing all the flox from the original parts. Holes were not drilled on NG3, so I followed Jack’s instructions for drilling and floxed into place, keeping the same dimension as shown in the plans (6.71″). This is hard to measure with all the clamps in place, but luckily I marked the sides of NG3 on the side of the strut during the test fit. I will double check the measurement after the flox is cured. Floxed the new NG2 foot onto the MKNG15 Assembly. Just snugged the bolts with 2 washers between the MKNG15 and NG2 for each of the bolts. Will torque to proper value after cure. This entry was posted in 13. Nose, Nose Gear & Brakes and tagged nose cone. Bookmark the permalink.